There’s a moment in Winstan Whitter’s U.K. skate documentary Rollin’ Through the Decades that shows a motley squad of baggy-dressed British skaters circa 1984. Three decades later, in a full switch from these poorly-dressed days, skaters have now become the cool kids. Vogue ran its own much-lampooned “Skate Week” last month on its website (“Here’s How to Do Skater Style Like a Model”) and the London-based skate brand Palace has curiously managed to amass as much cultural prestige as the high-end brands that their earliest t-shirt graphics happily bootlegged. Palace has grown remarkably, from a London clique to a movement that has kids queuing for clothing in the British capital’s notoriously moody weather. The ICA’s new exhibition, “The Palace,” is a document of this transformation that focuses on the people behind it rather than the gear, incorporating famed photographer Alasdair McLellan’s pictures of the Palace tribe as well as video work by co-founder and original crew member Lev Tanju. 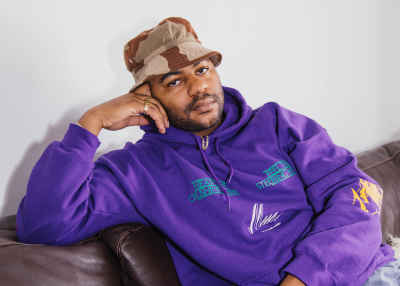 Before Palace became a brand in 2009, it was a place that Tanju and his friends called home. The original Palace was a distinctly non-palatial crew home in Waterloo. Situated within a few pushes of the famed South Bank skate spot, it housed some young men that member, skater and writer Stuart Hammond christened the Palace Wayward Boys Choir. An image of it takes pride of place in the exhibition, with its cracking windowsills and drab brickwork stacked above an outpost of Greggs, the U.K.’s ubiquitous peddler of cheap meat in pastry. Here, McLellan’s lens captures a kitchen-sink strain of Britishness, with snapshots of stovetops covered in the kind of grime that Drake is unlikely to co-sign. The home away from this home was the South Bank undercroft, a brutalist playground beneath the Queen Elizabeth Hall. Despite attempts to discourage skating and usher in re-development, it has been a gathering place for the city’s skate scene since the 1970s. 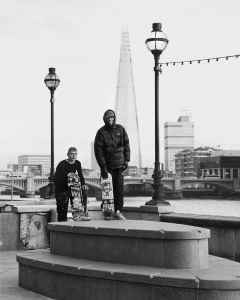 The raw concrete embodies the sketchy nature of London skating—reappropriation of whatever you can get, chipped teeth, concussions, and broken bones. It is a realm with mutating generations and its own self-governing local mentality—the same communal spirit that saved its residents from eviction in 2014. In the exhibition, the undercroft is as much a character as any of the individuals it depicts. While the hoodie taps into an archetype, there is a cross-section of eccentric and functional style shifts visible in South Bank. What’s being worn by the London skate scene has long been too culturally mixed to pin down to a single aesthetic. Its influences border on the infinite, and this is something Palace opts to celebrate. It is a cultural polytheism that has guided the output of the brand throughout the years. Some Instagram critics might get a jovial response from @palaceskateboards laced with London slang, while others visiting its brick-and-mortar location might forget that it’s a skate store—staunchly anti-poser—and walk away baffled that they were not greeted with a chest bump. This is the brand worn by Kanye West and Kim Kardashian’s daughter North West as a tiny customized shirt, but it’s also the one that signed divisive, defiantly New York skater Shawn Powers. It can stick a Photoshopped Patrick Swayze from cult 1991 action film Point Break on a t-shirt, but it can also get a trio of decks hung in the Tate Modern themed on John Martin’s The Great Day of His Wrath. Through the tangents and teeming masses of reference points and contradictions, Palace has afforded itself the freedom to do anything it wants to do. That “The Palace” opened the same week that a Reebok/Palace commercial starring the Oscar-nominated Jonah Hill went viral is a grand statement of where Tanju and friends started, and where they are right now. McLellan is no newcomer to their world. And the way he documents it captures the familial nature of the PWBC—as tattooed on fellow photographer James Edson’s arm in one 2009 photo. Each photograph is loaded with great affection, whether the moment is candid or as slick as a lookbook. 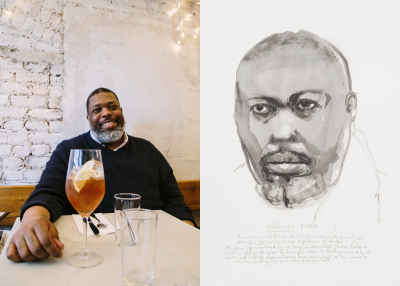 A central area is densely packed with portraits, and the promise of an upcoming book published by Idea Books this summer indicates that this is just a sliver of a bigger visual history. Looking at the photogenic faces of Blondey McCoy, Nugget, Lucien Clarke, and friends, it is evident that things have come a long, long way from the industry’s roots. “The Palace” is on display at the ICA London until July 24, 2016.